The latest start-ups emerging from University College Dublin (UCD) will be showcased at the 2017 UCD VentureLaunch Accelerator Programme Showcase and Awards event which takes place next Wednesday evening, 29 November, at the University. 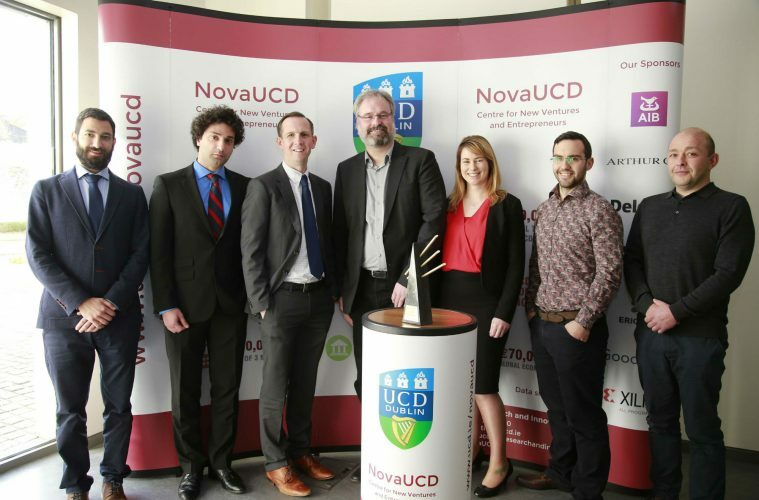 The overall objective of the 3-month UCD VentureLaunch Accelerator Programme, which is held at NovaUCD, the Centre for New Ventures and Entrepreneurs, is to support the creation and to accelerate the launch, of sustainable and profitable new ventures based on intellectual property emerging from UCD. Five new high-tech and knowledge-intensive ventures will pitch at the Awards event with the overall winner receiving the 2017 UCD Start-up of the Year Award and a €20,000 prize fund. The participating ventures are; En-Perium, PicoworX, PlasmaBound; Prolego Scientific and trustalink. En-Perium is developing a next-generation building energy analysis software system for architects, engineers and educators. The proprietary software combines 3D modelling, climate and physics simulation technologies with specific green building codes and certifications, in one system. The founder of En-Perium is Michael Mescal, UCD School of Architecture, Planning and Environmental Policy. PicoworX is developing disruptive, proprietary technology which provides a scalable continuous reel to reel process to enable the coating of large surface areas with vertically aligned carbon nanotubes. Such a coating is an ideal functional layer for next-generation photovoltaic cells, enabling ultra-high radiation absorption to improve the efficiency of solar harvesting by an unprecedented 50%. The founders of PicoworX are Professor Dominic Zerulla, Dr Pratheesh Nair and Dr Inbarasan Muniraj, UCD School of Physics. PlasmaBound has developed a novel patented manufacturing technology which removes the need for bolts when joining structural composites, thus eliminating associated mechanical and fatigue performance problems. Applying this technology advanced composite manufacturers will have the opportunity to build stronger, lighter and leaner composite assemblies to meet environmental directives and regulation. The founder of PlasmaBound is Dr James Nicholas Barry, UCD School of Mechanical and Materials Engineering and UCD School of Chemical and Bioprocess Engineering. Prolego Scientific offers proprietary data analytics and software solutions for the genetic testing of pedigree animals to improve animal health, performance metrics, the prediction of breeding values and to hence improve the quality of the food chain. The founders of Prolego Scientific are Dr Belinda Hernández, Associate Professor Andrew Parnell and Dr Mahdi Amina, UCD School of Mathematics and Statistics. trustalink helps banks protect consumers by finding trustworthy data on fintech firms online. trustalink’s software is powered by artificial intelligence to collect, verify, link and explore a unique layer of social data in addition to typical financial data available on fintech firms. The members of the trustalink team are Dr Elie Abi-Lahoud, Paul-Emmanuel Raoul and Professor Cal Muckley, UCD School of Business. The 2017 UCD VentureLaunch Accelerator Showcase and Awards event takes place on Wednesday, 29 November, in the UCD O’Brien Centre for Science, UCD, Belfield. The event commences at 5:15 pm when attendees will have the opportunity to meet with, and talk to, the founders of the new ventures during a showcase event. During the main awards event, which commences at 6 pm, the founders of each new venture will deliver an elevator pitch to an audience comprising members of Ireland’s venture capital, research, state agencies, industry and business communities. Dr Conor Hanley, CEO, Foundry Innovation & Research 1, Ltd (FIRE1), will be the guest speaker at the event. An overall winner, selected by an external evaluation panel, will be presented with the 2017 UCD Start-up of the Year Award. The winner will receive a cheque for €10,000 and a professional services package to the value of €10,000. The prizes are sponsored by AIB, Bryan Maguire Business Consulting and Deloitte. The overall winner will also receive free incubation space at NovaUCD for 1-year.